CBC News – Former residents of an Inuit settlement in Labrador are gathering this week to mark the 50th anniversary of their community’s closure. The former residents of Hebron, N.L., were joined at the abandoned settlement on Monday by Premier Danny Williams, who helped unveil a monument with the names of Inuit who were forced to abandon the community. 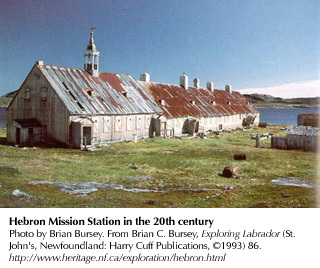 The Newfoundland and Labrador government closed Hebron in 1959, forcing the several hundred Inuit living there to move to communities in Labrador and northern Quebec. “I like the idea of having my name out on the monument, but they’re celebrating [a] 50th anniversary,” Kenny Jararuse, who was moved out of Hebron when he was a teenager, told CBC News on Tuesday. NationTalk: “Memorial to Former Residents of Hebron Unveiled” (Aug 10, 2009). Siku News: “A plaque recognizes relocation” (Aug 09. 2009). CBC: “Relocated Labrador Inuit to get apology monument” (July 24, 2009).